This is the paperback UK edition of The Shape Shifter, published in 2007 by Allison & Busby, Limited, London, England. The cover design is by Brighton Studios.com and shows a deer skull against a patterned background resembling a desert landscape with a repeated, overlaid geometric shape. Binding: Full-color paper covers with title, author's name, and publisher's logo printed on the spine. The inside front and inside back covers are blank. 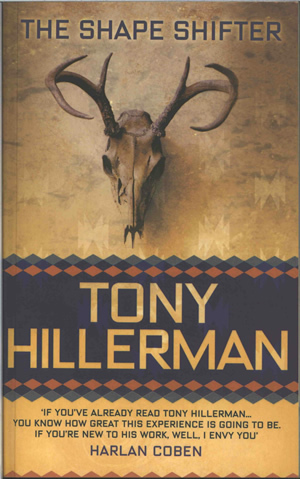 The back cover contains publisher's summary, praise for Tony Hillerman, the publisher's logo, bar code, and price.